Abstract: This article looks into the importance of selling in business and the relevance of the development of selling skills to career success regardless of your role in an organization. Really? 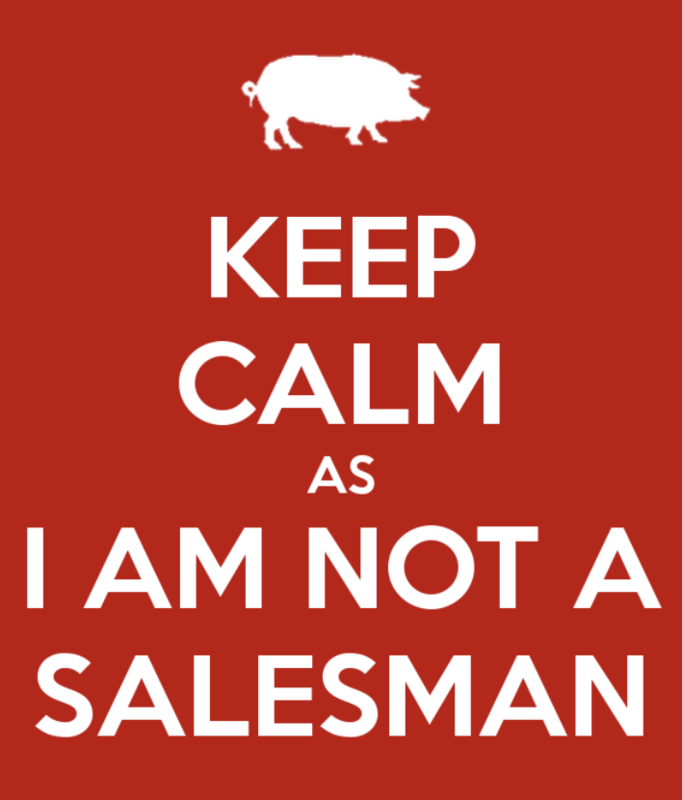 You’re not a salesman or saleswoman or salesperson? What are you then? Zig Ziglar and others argue that everyone is in selling whether he or she recognize or acknowledge it or not. I have come across people that say that they consciously and intentionally do not know anything about selling or that selling is below their station in life. Some of them have no idea that some of the best-compensated people in society achieve the success they enjoy from being successful in sales. What is selling anyway? I would define selling as bringing someone else around to your way of thinking. The hoped result of the selling process is that the other party will decide to act upon your suggestions and recommendations (closing questions). Sometimes this results in a sale for value in which goods or services are exchanged. In other cases, you are selling a concept or ideas like a strategy or recommended course of action to a decision maker that must put their reputation and possibly their job on the line by committing to your proposed course of action. When some people hear the term ‘salesman’ the image that pops up in their mind is the high-pressure wielding scoundrel at the ‘buy here, pay here, Se Habla Español’ used car dealership with the moussed hair, polyester leisure suit, braided leather suspenders, and patent leather platform shoes. The sales weasel is the offensive stereotype that ‘professionals’ avoid at all costs. However, the argument can be made that the scoundrel has a much easier way of making a living than those of us that make our living by selling ideas, concepts, and strategies into sophisticated organizations. He is not up against counterparties that in many cases are considerably more experienced, educated, credentialed or intelligent than he is. More often than not, the reverse is true. If you would just as soon not be bothered with selling, my suggestion is that you dispense with aspirations of obtaining or staying in a C-Suite role. What is a C-Suite? One definition is that it is a marketplace of ideas. The environment is characterized by continuous, ongoing debate of concepts and strategies to move the organization forward or respond to problems and threats. If you are not effective in getting your ideas heard, debated and accepted, you might want to start thinking about finding another way to make a living. If you cannot successfully sell your fair share of ideas in what is usually a very intimidating, competitive and sometimes hostile environment, your perceived value will fall along with the probability of achieving your career ambitions. What types of selling occur? Direct selling involves interactions with the intended purpose of an agreement to exchange goods or services for money. What I will refer to as professional selling is focused on winning in the marketplace of ideas. In other words, getting decision-makers to take your advice, respond to your counsel or choose a course of action based primarily upon your input. Professional selling is infinitely more difficult because it has a variable that is usually not present in direct selling – politics. The politics are carried out generally behind the scenes by competitors of yours that could be trusted co-workers that advocate for their ideas behind the scenes or behind your back, without giving you the courtesy or respect of a face-to-face argument. They use whatever leverage is available to them behind the scenes, under the table, and behind your back to advance their causes, frequently resulting in decisions that do not make rational sense. Suboptimal results occur because, in the presence of politics, decision making is usually irrational. For example, I experienced a situation where some physicians were not happy with some of the decisions coming out of the boardroom and the front office. Do you know how many visits I had from any of the doctors? The answer is zero! Instead, they took their grievances directly to members of the board or county commission that humored and engaged them possibly in utter and absolute ignorance of the degree to which this amounted to the active undermining of the leadership team of the organization. I learned that one board member was accosted in the church vestibule and never made it into the sanctuary to join their family for the service. Others are caught at their places of work or during unrelated social events. As we are seeing in our society right now, people that are sufficiently strident about their position will resort to extreme means including violence to have their ideology imposed upon the rest of us. If you are in a board meeting and something entirely unexpected comes out of left field and derails something that you have put a lot of time and energy into, there is a good chance you are a victim of cowardly, destructive politics. The stakes of success in a political environment are exponentially higher. If you are to be successful when you are up against political resistance, your arguments or the effectiveness of your selling must be sufficiently compelling to not only overcome the logical burden of your case but the political forces that may be working against you behind the scenes or maybe more accurately stated, behind your back. If this is not selling, I don’t know what is. Most of the time, to one degree or another, your career is potentially on the line when you are selling to your leader or a board of trustees. Must close selling puts you in an Apollo 13 situation where failure is not an option. I sold vacuum cleaners in college. I learned these concepts early on. In-home vacuum selling can be very intense, high-pressure selling. That said, selling vacuum cleaners is infinitely more comfortable than surviving in the shark tank that is the C-Suite of most organizations I have experienced. I guess that’s why good vacuum cleaner salesmen make around $50K and C-Suite roles pay into seven figures. So, the obvious question is what you should be doing? My recommendation is that you start dedicating significant time and energy to learning as much as you can about selling. The quintessential sales trainer is Zig Ziglar. He is one of the best but not the only one. I would also recommend Harvey Mackay. Both of these guys are retired, but their work is as relevant as ever. Effective selling requires a healthy positive attitude. There are many excellent motivational speakers. Some of my favorites are Les Brown, Earl Nightingale, Dr. Angela Duckworth, Zig Ziglar, and Ed Foreman. Don’t overlook some of the incredible ministers that deliver messages of hope and inspiration. For starters, I recommend Charles Stanley, Johnny Hunt, Robert Schuller, and Joel Osteen. I have found that the more time I spend listening to these inspiring people, the luckier I become in the marketplace of ideas in a consulting firm, among my compadres, in a hospital C-Suite or down at the local watering hole. Contact me to discuss any questions or observations you might have about these articles, leadership, transitions or interim services. I might have an idea or two that might be valuable to you. An observation from my experience is that we need better leadership at every level in organizations. Some of my feedback is coming from people that are demonstrating an interest in advancing their careers, and I am writing content to address those inquiries. The easiest way to keep abreast of this blog is to become a follower. You will be notified of all updates as they occur. To become a follower, click the “Following” bubble that usually appears near the bottom of each web page. I encourage you to use the comment section at the bottom of each article to provide feedback and stimulate discussion. I welcome input and feedback that will help me to improve the quality and relevance of this work. This blog is original work. I claim copyright of this material with reproduction prohibited without attribution. I note and provide links to supporting documentation for non-original material. If you choose to link any of my articles, I’d appreciate notification. If you would like to discuss any of this content, provide private feedback or ask questions, you can reach me at ras2@me.com. Next How will you do in a Job search? Great insight Ray! Successful C-level leaders”sell” ideas, concepts, solutions, and in many cases challenge ownership and Boards in a healthy way. Leaders that inspire, influence, persuade, and connect are “selling” for sure. Ray…just stumbled across this and enjoyed your perspectives. I always approached selling with the notion of finding our what people’s problems and goals were that might relate to my bag of tricks, then seeing if I could help them solve the problems or accomplish the goals. Put another way, before I blathered on about how great my company’s services were for anybody, I first had to believe that they really did apply to somebody’s particular situation and that they were a good fit. Seemed to work well for me throughout my career. Made a lot of friends, helped them accomplish their goals, oftentimes putting our company in a leading competitive position, etc. etc. Miss the chase and the challenges, not to mention the friends…including you. All the best. First, it is GREAT to hear from you, Julian. As always, you are exactly right and have a unique insight. For those that do not know you, you and your firm were incredibly effective adding value in the healthcare revenue cycle. Too much selling these days if focused upon trying to convince someone that they need something that you have they were not aware of. You and your firm engaged in what I would describe as consultative selling. You did not push anything on anyone. First, you worked very hard to understand a need then you custom fit a solution instead of selling a round peg to fill a square hole. You were not pushing – your clients were pulling solutions from you. Why? Because of the track record you established and the integrity you lived by. You weren’t selling as much as you were working collaboratively with clients to solve their problems. The selling occurred naturally. Whatever happened to people like you? All of the A/R firms have been rolled up into huge conglomerates that are more focused on building their revenue to a level to make them a target of an even larger firm for the purpose of enriching the executives. Client considerations are secondary. A principal in one of these firms told me over the weekend that they are required to earn a gross margin of >45% on every deal by doing whatever it takes to extract the maximum fees from clients. Compare that to your approach. I miss you and miss working with and around you Julian. All the best to you as well. The ability to communicate concepts and solutions to individuals and organizations that often have no concept of their need is often undervalued as “sales” but should be considered priceless. Great article and insight!